BOOT HILL BADDIES! 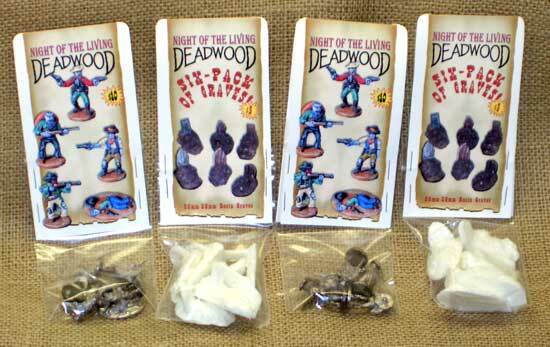 Be the first in your cemetary to own our Undead Cowboy miniatures and a six-pack of resin graves. Hawgleg is hittin’ the trail and hunting cowboy zombies in Transylvania this weekend. Or, more specifically, Gutshot co-creator Mike Mitchell will be attending UCon at the Little Church from Transylvania in Houston, Texas, and he’ll have a whole passel of stuff on hand from the upcoming game, Gutshot: Night of the Living Deadwood. The convention is an all-day event: Saturday, Aug. 2, 2008 at the Northwest Community Unitarian Universalist Church (NWCUUC), 5920 Hwy 6 North Houston, TX 77084. This is in Northwest Houston near HWY 6 and West Little York. The convention is billed as a “Pop-Culture” event and, in addition to gaming, will feature comic books, science fiction, movies, anime, manga, and possibly even goth. 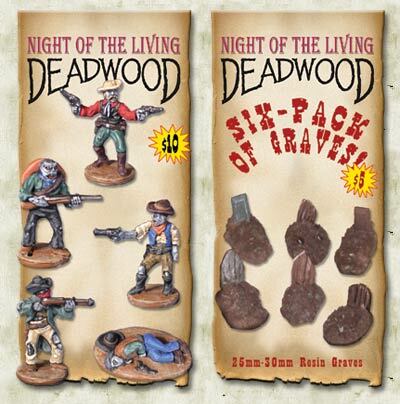 In addition to the playtest, Mitchell will also unveil a few items from the Night of the Living Deadwood product line. Specifically, he will be selling miniatures and resin graves. The miniatures pack includes four, unpainted 25mm undead cowboys and one “dead zombie” marker, for a total of five different figures. This pack will sell for $10 at the convention, or until supplies run out. Since these were cast before the recent increases in metal prices, the price will be slightly higher when they are recast in the future. The “Six Pack of Graves” contains six assorted 25mm-30mm grave mounds with a marker (some markers appear to be wooden while others appear to be stone). There are actually nine sculpts scattered throughout the six packs. So, although there are no duplicates in a single bag, if you buy two bags you will get some duplicates. The graves are cast in bright white resin, are unpainted and sell for $5. As a convention special, Hawgleg will pay the sales tax on all items. Although these items are being released at the convention first, they are not exclusive to it. In other words, we’ll put these items up on the Hawgleg Website sometime next week. Undead cowboys and graves are just the first two items that will be released to support the forthcoming game, Gutshot: Night of the Living Deadwood. The Hawgleg Posse has been working on them privately for a long time now, and this is the first time they will be tested in public. Mitchell said that it seemed “fitting” that the Deadwood merchandise would be released at “The Little Church from Transylvania.” The church, by the way, is called that because “Transylvania really was the site of the first Unitarian church,” said convention organizer Trey Wickman. The convention will run from 9 a.m. – 7 p.m., and includes a healthy mix of board games, card games, RPGs, and more. "I'm looking forward to this convention," Mitchell said. "When I was knee-high to a six-sider back in El Paso, we didn't have different conventions for comics, sci-fi, and RPGs. We just mashed them all together and had a great time. I'm kind of hoping this will be kinda like that, and give me a chance to meet some people who don't normally hang out in the Houston miniatures gaming community." Mitchell also wanted to give thanks to Kerry Harrison for letting him know about the convention. "Kerry is very active in the Houston gaming community, and I really appreciate him pushing me to get off my duff and make it to U-Con," Mitchell said. "With all the summer heat right now, it's very easy to sit at home under the AC and sip muh whiskey while watching old Westerns on TV. I reckon this con will be a lot more fun than that!"